DealDash has some amazing art. If you’ve recently won some, or have picture frames to hang up, you’ll want to read this article. Nothing puts a beautiful touch on a home or office like framed art. Whether you’re creating an in-home gallery, hanging a new painting won from DealDash or getting your family portraits on display, framed art can make your home look like a decorating magazine. Read on for the best way to hang those works of art. The first thing that you will need to do is install hardware on the frame itself, and also the wall. For the wall, you will either use a nail, which you will hammer right into the drywall or into a stud, a drywall anchor, or a picture hook. Of course, there are other methods, but these are the most popular approaches to accomplish your goal. The method you eventually choose for both parts will ultimately depend upon numerous variables. These variables include the size and weight of the photo, the material of the frame, and the surface you want to hang the image on. It makes a big difference if you are able to use a stud in the wall instead of having to use a drywall anchor. One of the oldest approaches of photo hanging is the screw eye and photo wire. Screw eyes are installed on the rear end rails of the frame, between one-quarter and one-third down from the top. Make certain you determine each side so the screw eyes are even. Turn the screw eyes into gradually and evenly until the eyes rest against the frame. Next, string the photo wire through the eyes, leaving sufficient slack in the wire for hanging. The wire can then be hung on a nail in the drywall with an anchor, on a wooden stud, or a picture hook. Picture hooks are offered by weight class. When in doubt, you should choose the hook ranked for heaviest paintings.The screw eye technique is reasonably basic, requires few tools, and hangs the image securely. For heavy duty pictures, D-rings are typically utilized. These are either with anchored screws or hooks. The installation differs depending on which hanging technique you choose. Again, it all depends on if you are putting your picture into drywall with an anchor or directly into the wooden wall stud. To use D-rings without photo wire, install them at the back top corners of the frame, making sure they are completely even.. Hang the D-rings directly onto heavy picture hooks or screws anchored into the drywall. Keep in mind that any installation using picture wire needs your best guess where the picture will really hang. This is because the wire is concealed behind the frame when you are attempting to hang it. This can be quite aggravating if you are doing the task solo. Keep in mind to use a drywall anchor with this installation as the weight of the photo might rip it out of the wall. These familiar jagged-toothed hangers are available in 3 types: nailed-on, screwed on and nail-less. Sawtooth wall mounts are installed in the center of the top back rail of the picture frame. You can do this by nailing, screwing or hammering. The wall mount needs to be low enough so it will not show above the top of the frame, and the teeth must face downward. Then simply hang the photo on a nail hammered into the wall, with about 1/4 inch of the nail extending. This is the easiest and simple way to hang your picture on the wall if it’s not very heavy. Hanging up your art and picture frames can seem like a lot of work. However, if you follow these tips you’ll see that it won’t be very difficult or take a lot of time. Thanks so much for reading this DealDash article on hanging up art and picture frames. Don’t forget to check back every day for new articles here. Also read our sister blog, DealDash Tips. We love to hear from our readers, just leave a comment down below. Do you need items for the home? Go check DealDash for art. DealDash has all of the home decor that you need. Visit DealDash now to see how much you can save. Have a great time on DealDash and happy bidding everyone! This entry was posted in Cleaning and Organizing, Home and tagged art, Deal Dash, DealDash, DealDash Auction, dealdash auctions, dealdash.com, decor, home decor, home organization, picture frames on August 25, 2018 by . Mason jars have been very popular lately, and you can bet that mason jar objects are a little bit more expensive than plain ones. Why not make your own mason jar crafts? Let’s start with a mason jar candle. Mason jars are a classic example of Americana, they bring back great nostalgic memories for a lot of people, especially people who had a grandma who loved to garden and can her own vegetables. Mason jars are everywhere now, and more often than not they are merely vessels to hold another decoration. Today we will use a mason jar to create a candle that you can enjoy for yourself or give as a gift. Cut enough wax off of your block to fill your mason jar about 75% full – this doesn’t have to be an exact measurement, you can always save the rest of the wax for another time if you don’t need all that you prepare. Put your pot on the stove, place your glass measuring cup in the pot. Place your wax in the glass measuring cup. Put enough water in the pot to come about 1/2 way up the glass measuring cup. Put your burner on medium heat and wait for the wax to melt. Put a dab of super glue or glue from a glue gun on the bottom of your mason jar and stick the bottom end of the wick down. You can then put a pencil across the top of your mason jar and lightly tape the top of the wick to the pencil to anchor it so it doesn’t move around when you pour your wax in. When your wax has melted you can now add your scent and color if you so desire. You can also leave it scentless and colorless if you like. Using a pot holder, pick up your glass measuring cup and pour your wax very carefully into your mason jar. Try not to disturb the wick too much, and don’t over-pour the wax, be sure to leave some of the wick visible. Remove your pencil anchor and trim the wick to your desired length. Wasn’t that an easy and fun project? If you are in the market for more home decor items be sure to check DealDash. DealDash has many home decor, art, and useful home items up for bid. Just click this link and it will take you to DealDash. Good luck and happy bidding everyone! This entry was posted in Uncategorized and tagged art, craft, Deal Dash, DealDash, DealDash Auction, dealdash auctions, dealdash.com, decor, decorate, home, home decor, house, mason jar, project on September 19, 2016 by . As a busy mom of three sometimes I struggle with remembering who has a doctor appointment, who has a dentist appointment, and what I have planned for the week’s dinners. Enter the chalkboard calendar. There are different kinds of pre-made chalkboard calendars out there, and of course there are plenty of plain chalkboards, but I was looking for something more special than that. I was planning on giving it a prized position in the kitchen above my new buffet cabinet, so everyone could easily see what was going on the upcoming week. I looked and looked, but I had a hard time finding one that was big enough, framed tastefully to match my kitchen, and wasn’t $180. Yes, the only one that I found that I liked was $180. So I decided to make my own! It’s really very simple and easy. You only need a few items to make your new chalkboard calendar, and you can spend only a few dollars on up to as high a limit as you would like to go. The smaller chalkboard calendar that you make the cheaper it will be, because the most expensive thing that you are going to need is a picture frame, and picture frame prices seem to raise exponentially with size. Picture frame – Any size that you want that will fit your space and your budget. I personally went to the craft store and used a 40% off coupon on a beautiful bluish-gray frame that was sized 16X20. After the discount I paid around $20 for it. Chalkboard contact paper – They sell rolls of this at the craft store, and also at Wal*Mart in the drawer liner section. 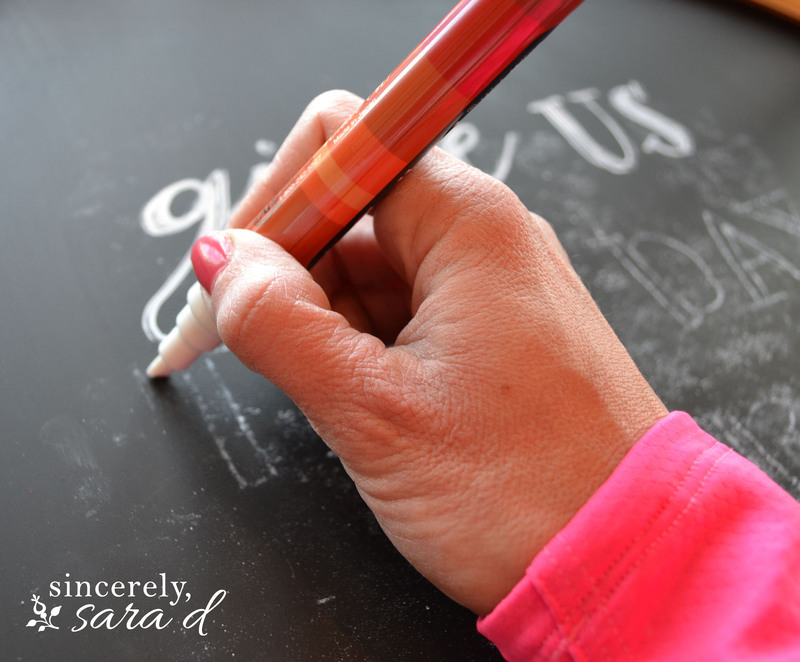 The chalkboard contact paper is very inexpensive. Paint pen – You can get them at the craft store in any color that you like. Measure a piece of chalkboard contact paper that will fit your frame and cut it out. Draw on the chalkboard with your paint pen, this information will be permanent. I chose to put our last name at the top, the days of the week, and then a section for “To do”. Peel off the backing on your chalkboard contact paper and stick it right on the glass of the picture frame. Hang up your picture frame. Bam! You’ve got a personalized chalkboard calendar! Use those chalkboard pens and write out your agenda, dinner plans, appointments, anything that you would like to remember. The chalkboard paint should rub off easily with a cloth and a little water, but the paint pen words should stay put. You may have to refresh them occasionally, or you could just peel off the chalkboard decal paper and put a new and fresh one on occasionally. Wasn’t that easy? I found that it was really fun to make and looks very nice when hanging on the wall. It’s nice because you can get any frame you like from the craft store to match your decor. If you are shopping for any other decor for your home be sure to check out DealDash. DealDash has decorative items as well as furniture. Good luck and happy bidding everyone! This entry was posted in Uncategorized and tagged arts, crafts, Deal Dash, DealDash, DealDash Auction, dealdash auctions, dealdash.com, decor, decorative, family, fun, home, house, kids, make, project on July 25, 2016 by .